Our latest catalog has just arrived and there’s a lot of talk in the office about which of the 70 new products are our favorites. These three games are definitely leading in votes. Hello Sunshine!, Zingo!, and Roll & Play are fun, interactive games that teach key concepts to young learners and are a perfect fit for any EI program. Hello Sunshine! is a charming game will have you and your children laughing and playing while learning prepositions. You can play hide and seek with Sunshine – a huggable plush toy – while teaching positional concepts such as In, On Top, Below, Next To, and more. Pick a card and then hide Sunshine BEHIND your back, NEXT to a chair, IN a bed…The toy comes with a storage pocket for the 18 double-sided cards (36 images). Hello Sunshine! builds vocabulary and language skills through smiles. 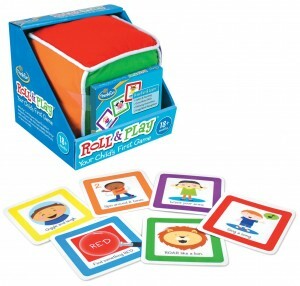 Roll & Play is an ideal first game as it gently introduces young learners to play patterns and rules of a game through interactive activities that encourage creativity, active play and gross motor skill development. Roll the big, plush cube and identify which colored side faces up. Choose a matching color card and perform the simple activity shown. Players will “Make a happy face,” “Moo like a cow,” and “Find something red.” The activity cards cover six categories that are part of early development: Emotions, Counting, Body Parts, Colors, Animal Sounds, and Actions. All of the activities are designed to let children shine, supporting their development and celebrating their success. The plush cube comes with 48 cards, 8 in each category and a parent’s guide. Zingo! is a wildly popular game that’s a fast-paced, energetic variant on Bingo…with a zing! 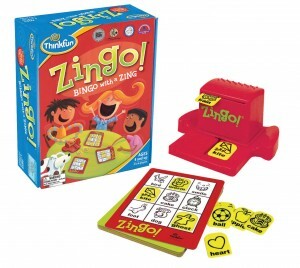 Zingo encourages pre-readers and early readers alike to match the pictures and words on their challenge cards with the tiles revealed in the Zinger device. The first player with a full card wins by yelling out “ZINGO!” Two levels of play and game variation ensure that the zaniness won’t end. In addition to delighting players of all ages, Zingo builds language and matching skills, concentration and social interaction. 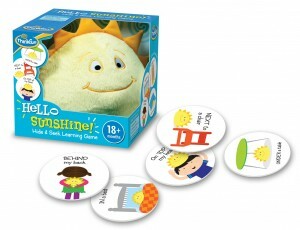 This week only, save 15% on Hello Sunshine!, Roll & Play, and Zingo! by entering the Promo Code BLOGEIG2 at checkout. *Offer expires on April 2, 2013 at 11:59 pm EST. Not compatible with any other offer. Be sure there are no spaces after the Promo Code when you enter it at checkout. Written by: Different Roads to Learning on March 26, 2013. This entry was posted in Difflearn Promo Code, Pick of the Week, Playskills, Products, Sale and tagged Early Intervention, games for young learners, special needs, teaching tools by Different Roads to Learning. Bookmark the permalink.